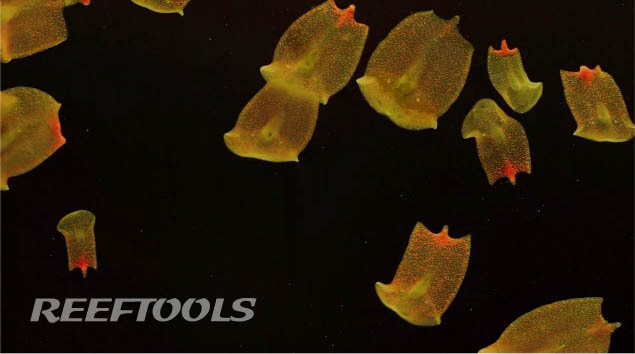 Flatworms in HD, thanks Morphologic Studios! The flatworms (Convolutriloba retrogemma) featured in the video are shown at 3x normal speed. They each range from 2-4mm in total length. These particular flatworms harbor symbiotic zooxanthellae in their thin tissue and utilize the excess sugars they create as their primary energy source. Packets of zooxanthellae can be seen as the tiny, red-brown dots along the back of flatworm. Their reliance upon this photosynthesis requires that these flatworms bask in sunlight like little photovoltaic cells, and enables them to live without a developed digestive system.